Did you do The Open last year? If so, did you have any kind of PR’s or try anything new? This is my first Open but I started to become interested in professional CrossFit athletes around this time last year and watched them perform the Open online. Since watching them I knew that a goal of mine would be to do The Open once I joined a gym. Why are you doing it this year? I am doing The Open to step outside of comfort zone and push myself harder than I thought was possible. 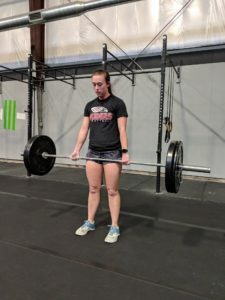 Also I want to be part of the CrossFit community and see where I stack up against other people in the gym and outside of the gym. What is your approach? Do you have any particular goals or doing it just for fun – or a mix of both? My goal this year is to just have fun, push myself, and become an all around better CrossFit athlete. I at least want to RX one movement or more in a workout, but know that most of them will need to be scaled. Anything else? I am very nervous yet excited to start something new and see where it takes me.